This software is written for fun. Feel free to download or freely distribute it! The current version contains two modules Finding your Suitable Home or Office and Your Numerology Reading. 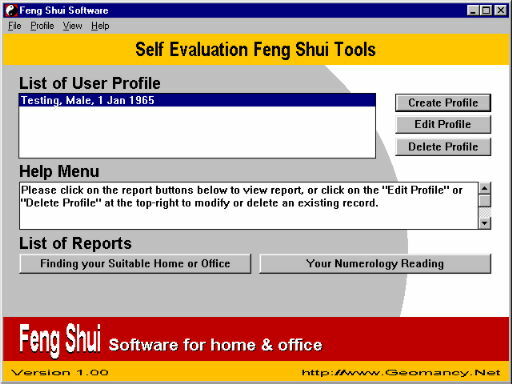 Please enter the Chinese date of birth to generate the reports. No Calendar conversion module included, meaning you need to input the Chinese Lunar Date of Birth. Based on Simple Eight House and Numerology Analysis Only. No future release/bug fix if any planned for release. Though, no major bugs were found at the time of development in 1998/1999. For accurate and up-to-date asssessment, you should make use of the online web reports.